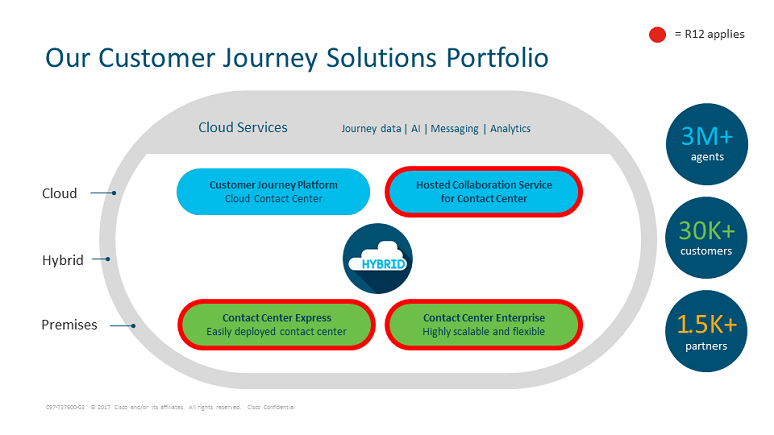 Cisco this week announced the Customer Journey Solutions 12.0 release for its on-premises and hosted contact center offerings, bringing a slew of enhancements touching the customer experience; agent, supervisor, and IT productivity; and organizational aspects such as scalability, security, and support for an open ecosystem. This release reflects Cisco’s understanding that not all enterprises are ready for the cloud, a realization that Vasili Triant, GM and VP of Customer Care at Cisco, said came to him after he joined the company a year ago and began talking to customers. As a result, Cisco has shifted its strategy, and is now working to bring its cloud and premises experiences together, he said. As this release shows, Cisco is starting with improvements for the agent experience, Triant said. With 12.0, Cisco is aiming to enable contact centers to deliver omnichannel customer interactions, improve first contact resolution through better use of agent resources, boost agent and supervisor productivity, and better manage complexity with more scalable systems. Some customers, including a 15,000-user takeout company, already are deploying 12.0, Triant said, noting that this goes against the typical 12- to 18-month delay Cisco tends to see with new releases. Hear more from Vasili Triant at Enterprise Connect, coming to Orlando, Fla. March 18 to 21. Triant will take to the mainstage on Wednesday, March 20 at 10:45, in the panel, “Why Customer Engagement Is Leading the Enterprise Communications Conversation.” If you haven’t yet, register now to take advantage of our Early Bird Rate. As a No Jitter reader, you can use the code NJPOSTS to save an extra $200!